Responsive, Responsive, Responsive. Maybe Team ICND sounds like a broken record, but that is because Responsive Design WORKS! 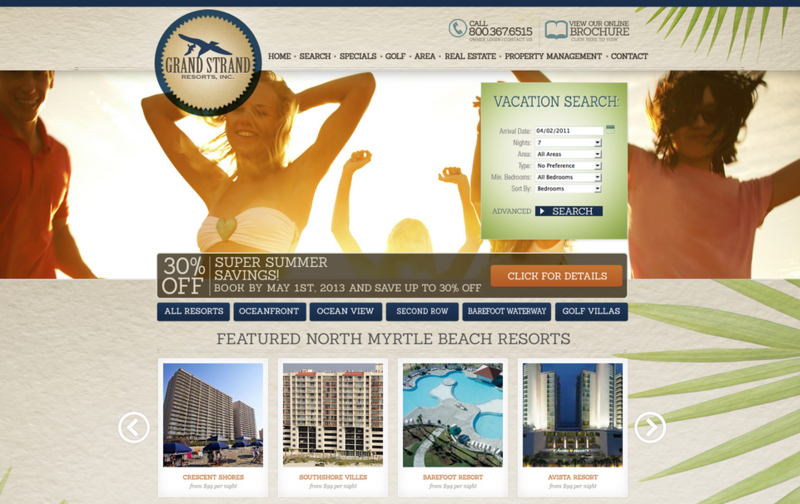 Grand Strand Resorts, a loyal client of InterCoastal Net Designs, has recently turned to us for a responsive website redesign. We’re completely overhauling their look to bring a more modern and aesthetically pleasing feel to their online persona. And of course – the site will be responsive, being that this is the latest, industry-endorsed method of mobile friendly platforms. We’re aware that many website design and online marketing firms offer the same services as ICND, therefore, when a longtime client stays with us for a redesign, we take this as the utmost compliment of our quality of work. Grand Strand Resorts is currently undergoing a move to Barefoot Property Management Systems. ICND works directly with Barefoot as a Barefoot-preferred Web developer, making booking engine integrations with Barefoot seamless and successful. Be on the look out for Grand Strand’s site to launch next month!